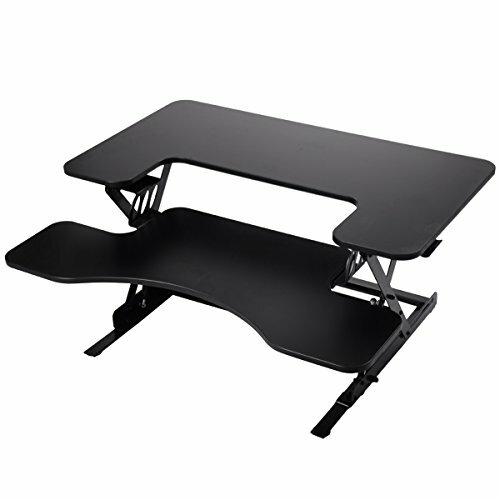 This Ergonomic standing desk workstation provides an easy solution for integrating a stand-up experience through your workdays。 Our quality standing desk is excellent for those chronic pain. It is convenient to switch between sitting and standing and bring health benefits to you. Spacious desktop is roomy for your monitors, keyboard, stapler, mouse, cell phone, note pad, fan and more office supplies. And it is easy to relocate to another office or desk. Its capacity is approx. 50 lbs, and remain steady even its completely extended. There are many science based health benefits of using standing desks. It deserves your purchase.